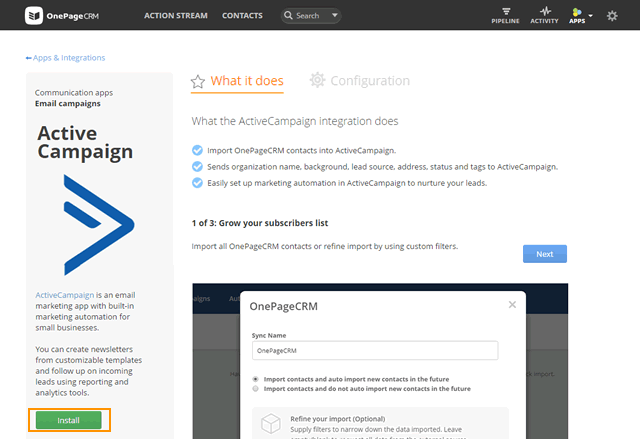 ActiveCampaign is an email marketing app with built-in marketing automation for small businesses. 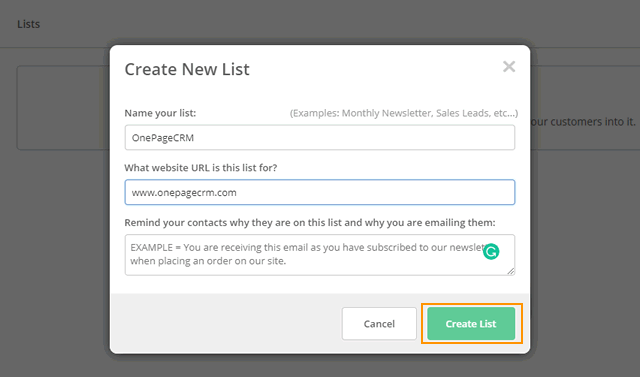 This integration will enable you to create newsletters from customizable templates and follow up on incoming leads using reporting and analytics tools. 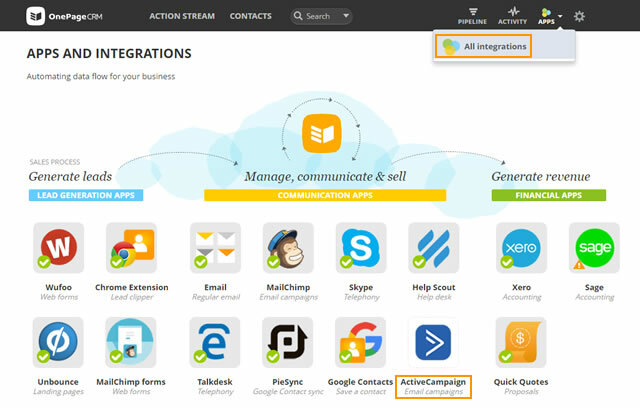 Go to Apps → All Integrations → click on the ActiveCampaign logo under the Communication Apps category. In the Configuration tab → Connect ActiveCampaign to OnePageCRM, enter your ActiveCampaign Account name and click Save. 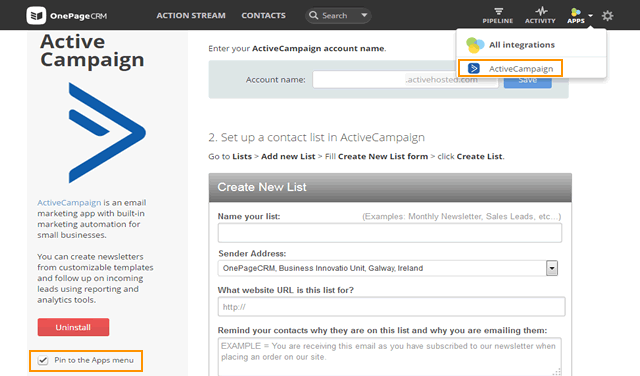 Log in to your ActiveCampaign account→ go to Lists → click on Add New List button . Complete the Create New List form and click Create List. You will be directed to Lists page where you can directly Import contacts or alternatively go to contacts → import. In the Import Contacts page, you can Import from file or Connect with other services to have new contacts added automatically → select OnePageCRM and click Next. 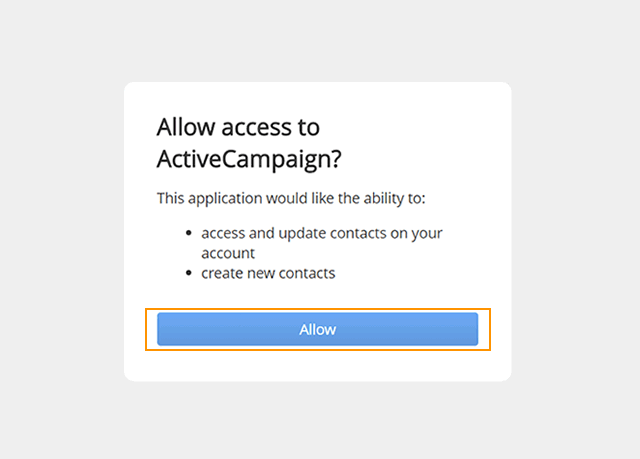 Click Allow to give OnePageCRM access to ActiveCampaign. Choose the list you wish to import contacts to and click next. In the pop-up, enter Sync Name, set your sync configuration and click Next to save your preferences. 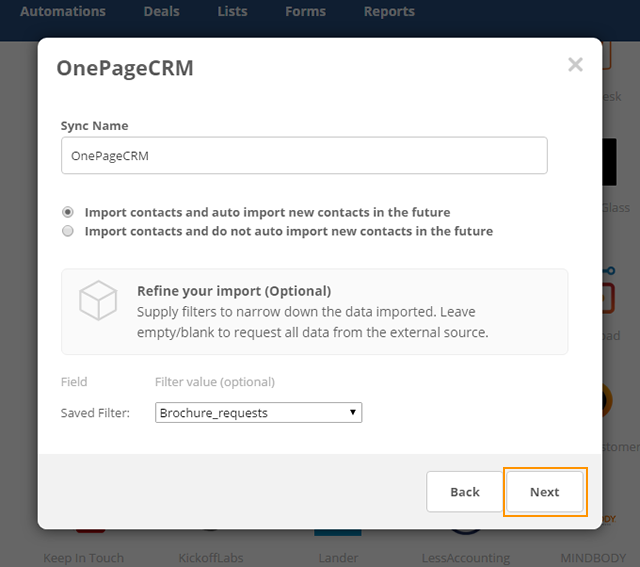 The import will commence and once your OnePageCRM contacts are imported and synced, you can start creating campaigns for them in ActiveCampaign. To pin the ActiveCampaign integration to the Apps menu, select the check-box: Pin to the Apps menu. ActiveCampaign integration can be enabled and configured by the Account Owner or Administrator user. Organization name, background, lead source, address, status and tags are sent to ActiveCampaign (Custom fields are not).